Brighton & Hove Albion defender Gaetan Bong. Picture by PW Sporting Photography. 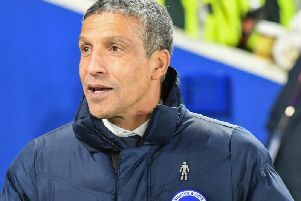 Chris Hughton says Brighton & Hove Albion defender Gaetan Bong has the club's full support after the Cameroonian suffered abusive chants and booing during their 3-1 victory over West Browmich Albion in tonight's FA Cup fourth-round replay. West Brom's Jay Rodriguez was accused of using racist language towards Bong during the Baggies 2-0 win at the Hawthorns last season but the charge was 'not proven' by The FA. Bong came on as a 105th-minute substitute and was booed as he took the field to replace Bruno. The Albion defender also suffered abusive chants aimed at him referring to the incident. The Cameroonian and Rodriguez did not share the pitch after the Baggies forward made way for Craig Dawson at half-time. Speaking on the incident, Hughton said 'it was difficult not to' hear the abuse Bong suffered and pledged that Brighton would give 'all of our support' to the left-back. He said: "Of course I heard them. It's very difficult not to. "This is due to something of course from last season, but what I always prefer to do is talk about the individual. "In Gaetan Bong we have an outstanding individual and always all of our support goes to our own players. "Yes, I heard it. It's not nice but it's very much about supporting our own player. "What we have in Gaetan is a very upright individual, a very upright, honest individual. He's a seasoned professional. "He went through a bit last season but that's in the past. I think anything that we might have heard tonight, certainly what Gaetan would have wanted to have done, or wants to do, is very much get on with his football. "He conducted himself impeccably last season and all he wants to do is get on with his football. He always has our support." West Bromwich Albion boss Darren Moore added: "I didn't hear the chant. I heard some of the chorus of boos because obviously home support and we knew what the incident was. "The game is finished, it's over with now and we move on. We can't let those things overshadow tonight."